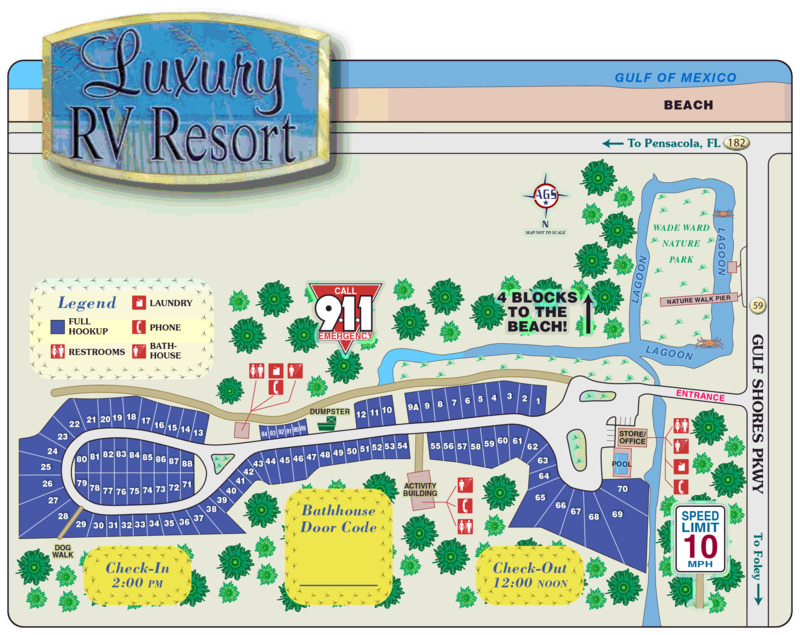 Ask fellow campers about "Luxury RV Resort" and nearby attractions. Question: Does this park have any green space for dogs? The name of this park is a joke--there is nothing luxurious or anything resembling a resort about this park. No shade trees, lots of tall weeds (that were eventually mowed down), lots of rules and regulations specifically about picking up after your pets (you have to sign a form). The only things this place has to offer are a decent price and a good location. We camped at Luxury RV Resort in a Travel Trailer. Specify you do not want Sites 89-92, the smallest and shortest sites in the park and right next to the one and only dumpster. Incredibly beautiful, convenient to shops, restaurants, businesses, Gulf of Mexico beaches. This little beauty (88 spaces) is a bounty of WOW! Nicely appointed concrete wide open back-in spaces, all utilities, friendlier than friendly front desk gals will welcome you with warmth & a HUGE smile. Showers & restrooms are pristine!! Large pool, beautiful rec hall with lots of events. I will be returning in Oct for my 3rd winter. There are folks that have been staying at this park in winter for over 2+ decades. Staying at this park the last 2 winters has been the highlight of my travels! We camped at Luxury RV Resort in a Motorhome. Best location in the Gulf Shores area. Only RV park within walking distance to the beach. We camped at Luxury RV Resort in a Motorhome. Several nice restaurants may be walked to. The Dollar General in the next block has a large supply of groceries - very convenient. Concrete pads. Nice and level. Nice breeze from the gulf. We camped at Luxury RV Resort in a Motorhome. This was our third visit. The park is four blocks to the beach, an ideal location for walking around town. The sites are gravel but are well-manicured. The general area is quite dry-we found cactus growing on a couple of walks-so grass isn't practical. Our site was level and easy to back in to. We camped at Luxury RV Resort in a Motorhome. We enjoyed how close we were to all the attractions. Very noisy, and not kid friendly at all. No place to set up any games in grassy areas. The grassy area covered in pet feces. Passerbys would tell us be careful that's where all pets use restroom. Really??? We camped at Luxury RV Resort in a Motorhome. There was no tax so the cost was exactly $35/night. Efficient reservation and check-in process. All hook-ups worked perfectly. Wifi was typical for an rv park - intermittent at best. Verizon cell, Sprint Mifi and DirecTV all worked well. We loved our stay here. Everyone - including staff and fellow rv'ers - were the friendliest we've ever encountered. While many snowbirds spend several months here and know each other, they are extremely welcoming (but never bothersome). There is lots to do in the area and many conveniences nearby (shopping/restaurants/etc.). It's a short walk to the beach and a quick bike ride to Gulf State Park. Putting out a mat will help with tracking sand into your rv. We wish we could have stayed longer and hope to return one day. We camped at Luxury RV Resort in a Motorhome. Avoid riding your bike on busy Hwy 59. Drivers are not "cyclist aware" and make it very dangerous for cyclists. Alabama state law requires a 3 foot distance between vehicle and cyclist. The police don't enforce this law which is disappointing. Not a bad park for the price ($32.00 based on weekly rate). All sites back on to a swampy bayou. Our site (55) had pretty decent wifi. All the hookups were in the right spot 9power cord was a bit of a reach but it worked). Cable also worked great with a ton of channels. Too cold to try the pool but it looks nice and clean.One can easily walk to the Gulf and the beaches. Lots of good restaurants close by. Would stay here again! We camped at Luxury RV Resort in a Fifth Wheel. We Love Luxury RV! Have stayed here many times and always have a wonderful time! It is very clean, very quiet, and the staff is very helpful. We have even stayed in the very first site and you cannot hear a peep from Hwy 59! One of the reasons we love this park is because of the convenience to everything. You could literally park and not start up your tow vehicle one time if you didn't want to! You can walk or ride your bike to just about anything you wanted to!! We camped at Luxury RV Resort in a Motorhome. 2 blocks from the beach! You gotta go to the Dollar General right down the street...they have virtually everything you might need, and then some! Many, many restaurants, shops, and stores within a very short walking distance and right next to the Gulf State Park with a very nice walking trail. Agree with the last 2 reviews. It is very close to beach, eating places, but has no trees. It is mostly sand with limited amount of grass. Staff is very friendly and everything is kept extremely clean. Left turn into the park is a challenge. Pads are narrow with small area for picnic table. We camped at Luxury RV Resort in a Motorhome. Oyster House across the street is excellent but go early or the wait to get in will be quite long. Don't let the word "luxury" fool you. There is NOTHING luxurious about this park. The location is good for beach access but that is about all. If you like camping in a parking lot then this is the place for you. It is merely a bunch of concrete pads with a tiny pad for a table. you better have a good AC unit because there is no shade. No character and definitely no Luxury. Would never stay here again. We camped at Luxury RV Resort in a Fifth Wheel. Nice level concrete pads, could use a little more vegetation around the park, sites are a little close together ok. The best part of this campground is close proximity to businesses and the beach. If you ride your bike, you're at the beach in 5 minutes. Good customer service. WiFi not great, only 3 showers 3 toilets for entire campground resulted in waiting. We camped at Luxury RV Resort in a Travel Trailer. Location was easy to find, but turning left into park was an adventure as traffic was heavy on Alabama 59. Arrived on a Saturday at noon and they said we could go ahead and check in. Started me off with their rules, coming off to me as being strict about noise, scooters and especially dogs. After the stern warnings, the staff was most helpful about where to eat, what to do, etc. Our campsite was spacious, as we were on the approach to the trash dumpsters. Other sites weren't real cramped though. We backed up to a woodlands marsh. Despite the outdoorsy feel to the campground, we were within three blocks of 16 restaurants and the beach!!!! We rented a car, but really didn't have to, as we could walk to everything in downtown Gulf Shores. The pool was well kept and on the afternoon we were there, there were multiple couples hanging out in the water, enjoying cocktails and socializing. Some parts of the park are a pretty far walk from the bathrooms. There were only two showers in our bath house, which for the size of the park, seemed minimal. That being said, I never had to wait to get in to the bath house. The laundry room was nice and roomy. Ice and other items are sold on site during office hours. I don't think I would be exaggerating if I said that we could've never left the park and had an enjoyable experience, between the pool and the wetlands our site backed up to. We camped at Luxury RV Resort in a Motorhome. Walking distance to the beach, bars, restaurants, retail etc. Dollar General is also close by, as is one of the state package liquor stores. We had a long, wide, concrete back in site with patio and table. Out our back window is a marshy wildlife area and view of the high rise condos about a mile away on the beach. Plenty of manouvering room and parking for our truck. Our original plan was to stay for a week, but we ended up staying for two weeks, since the park and the area are so nice. Wal Mart is about 1 1/2 miles away, along with restaurants, theaters and amusements. Gulf Shores State Park beach is just a short drive away, with some of the whitest sand and bluest water imaginable. Most days, we saw The Navy Blue Angels flying-awesome! We camped at Luxury RV Resort in a Fifth Wheel. A drive around the bay to Bellingrath Gardens, south of Mobile was just excellent. The gardens are amazing! You can tour the USS Alabama battleship in Mobile. There are lots of good places to eat around here, fast food to fine dining. Seafood is plentiful and don't miss Lamberts, "Home of Throwed Rolls" in Foley, you will not leave this place hungry! The location is the best part of this park. It is a 3-4 block walk to the ocean/public beach as well as many stores and restaurants. Sites are roomy enough for a 40ft Motorhome plus tow vehicle and a nice patio area (located near the rear of the pad). There are two sewer holes to choose from, whichever is most convenient for your setup. The park was not full while we were there, so it was pretty quiet and didn't seem too crowded. Not sure what the prior review meant about the dumpsters. Typically they are located near the entrance, so if it is too far to walk (maybe 150 yds), then just put the bag in your car and drive it up on the way out. Not a big deal at all. Laundry was nice and $2/each for washer/dryer. Level, concrete sites with sand between for that beach feel. We enjoyed our stay and everything the area had to offer. I would't call the park "Luxury" but it worked for us and we would return. We camped at Luxury RV Resort in a Motorhome. 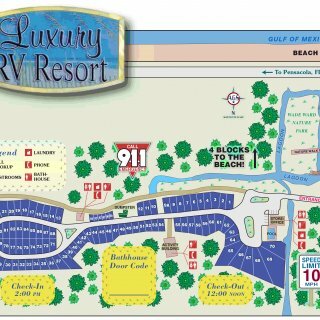 Are you affiliated with Luxury RV Resort ?